Thinking About Breathing New Life Into Your Restaurant? Customers dine out for two reasons: good food and a good ambiance, but what happens when your establishment becomes old or rundown? Over time, an out-of-date restaurant can be discouraging to even your most loyal diners. Don't let your customers slip away. 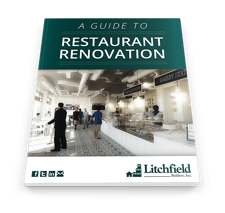 Download your free copy of "A Guide to Restaurant Remodeling in Connecticut" today!